The kitchen is one of the most-traveled rooms in the house, so it should be somewhere that you want to be. If your kitchen is cramped, dark, or otherwise unpleasant, then maybe now is the time to consider designing a new kitchen. The possibilities for improvement may surprise you. 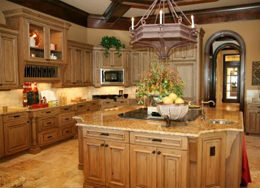 We have completed many kitchen remodeling jobs, so we have many examples to show you of our amazing kitchens. 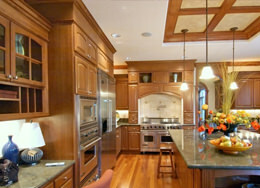 Throughout our years of experience in this area, we have mastered many of the most popular features in modern kitchens. Speak to us about improving natural light, air quality and energy efficiency in your kitchen. You want to work with experienced professionals when you’re renovating your kitchen. Our building professionals have been handling renovations and remodeling for more than 25 years. We have many samples available of the kitchens that we have completed, and we’re happy to show you how we can turn your kitchen into the one that you’ve seen in your dreams. You always get what you want when you work with Excel Builders. While we’re happy to offer our expertise when it comes to planning the new look for your kitchen, it all comes down to what you want. We use every ounce of our experience to execute your vision, and leave you with a kitchen that you’ll be proud to show off. We have also developed a lot of expertise when it comes to building green kitchens. Are you looking to bring a green perspective to your kitchen? There are actually many different ways to do this, and we can tell you about them or even implement them for you. Whether your intention is to save some money on your energy bills or do your part to help the planet, going green is easier than ever before. What’s the most important environmental problem with a conventional kitchen remodel? Energy consumption is the biggest problem, followed very closely by bad ventilation and bad lighting. The most energy-intensive room in the house is the kitchen. The number one problem with conventional kitchen remodels is oversized and energy-inefficient appliances. The U.S. Green Building Council’s “10 Ways to Make Your Kitchen More Resource Efficient” offers suggestions on finding the appropriate sized appliances and other tips to save money and energy in your kitchen remodel. What environmental problems are associated with using a conventional kitchen? Energy is often wasted as the result of poor appliance choices, including dishwashers that can use way more water than is actually needed per wash. The paint and stain used for walls and cabinetry often contain toxic chemicals that are constantly emitting. Many flooring and insulation materials contain formaldehyde which is toxic to the human body, and overconsumption of energy due to poor natural lighting and ventilation are quite common. Poor ventilation also leads to poor air quality. The supplies you use to clean with are also a big factor; ammonia and bleach are toxic chemicals, and can be replaced with environmentally friendly cleaning products that work just as well. What are the health benefits of the green remodeling process, and of using a green kitchen? Having a well-ventilated and naturally lit kitchen will have an immediate effect on your mental well-being. The physical health benefits come from not being exposed to harmful chemicals, which do have an effect on our bodies. Is there scientific evidence for these health benefits? Yes, even though this are could use more study and resources the fact is that there are numerous studies that have been and are still being conducted that show the connection between hazardous chemical exposure and mental impairment and/or disabilities. Check out Green Building Costs and Financial Benefits, a report from the Massachusetts Technology Collaborative for more information. How does the green approach affect maintenance and operating costs? Whenever possible we are using repurposed materials which save you money. Energy efficient appliances; your freezer, dishwasher, and microwave will all of course have a much lower operating cost. With a plentiful amount of natural lighting there is less need to turn the lights on, and finally using non-toxic cleaning agents and having good ventilation can reduce the risk of respiratory illnesses. What are some of your favorite innovations or design ideas for a green kitchen? Double paned, argon insulated windows are a great energy saver and windows traditionally lose a lot of energy. Having a composting container near a food prep area is a great way to cut down on your waste stream; compost can then later be used to fertilize your garden; a dish-drawer dishwasher, which is great for smaller loads.